Trucks are regularly held over five hours at the Croatian border, despite the maximum period of two hours allowed by law. 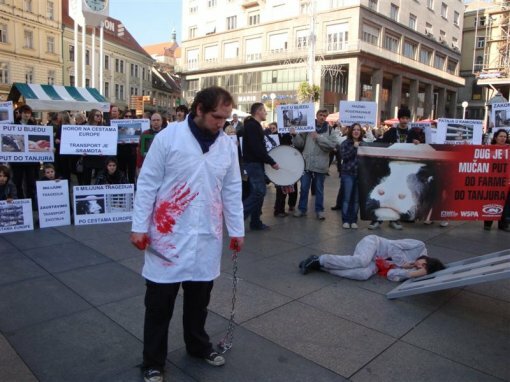 The agonizing journey of animals transported from the European Union often lasts for days. Live animal transport is completely unnecessary, unethical and cruel, and should be completely banned. 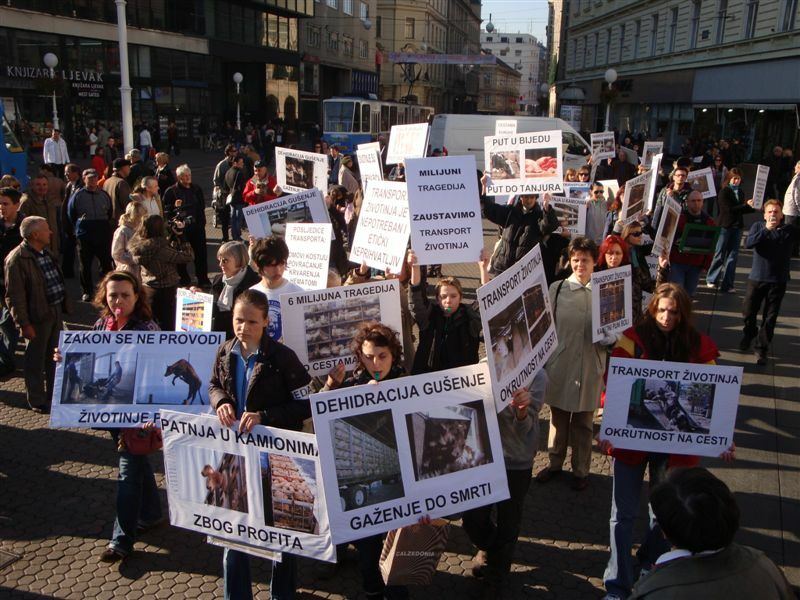 In order to show to the public the everyday suffering of animals during transport, on Saturday November 21, 2009 coming from Marshal Tito Square to Ban Jelacic Square at 12 noon a long protest march against animal transport will move. A "transportation truck" full of activists will accompany the procession as part of the performance. The EU and the Republic of Croatia need to immediately sharpen the existing laws; first of all by limiting the maximum period for live animal transport to no more than 8 hours and after that to completely ban animal transport. Many associations and institutions united in the international "Handle with Care" campaign, initiated by the World Society for the Protection of Animals (WSPA), agree with that. 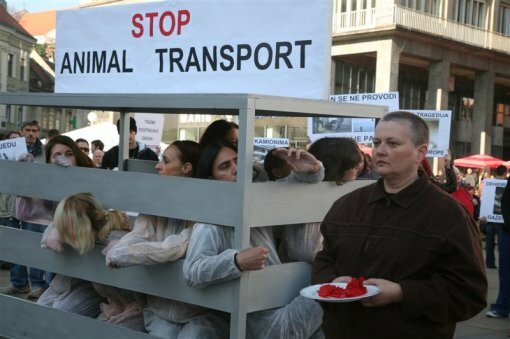 Animal Friends stresses the connection between the contents on the people's plates and the cruelty to animals turned into commodities and invites citizens to think about changing their eating habits in order to reduce the suffering of animals in trucks. 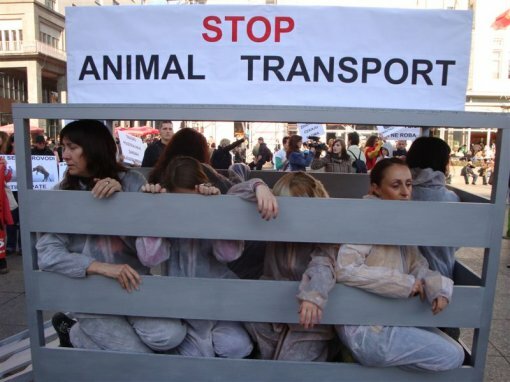 In the last few years scientists have reached a consensus on the extremely high level of mental and physical stress in animals in transport. 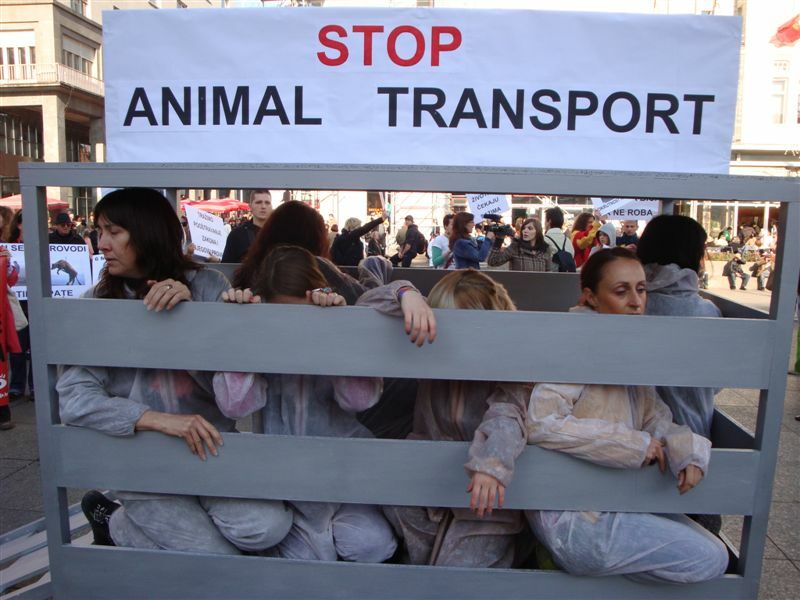 As a consequence, many countries have introduced different degrees of regulations for conditions of live animal transport. However, practice shows a defeating truth about many undefined terms in the regulations and their inefficiency. Further legislative changes and more severe enforcement of the law are necessary. However, it is inevitable to raise public awareness that consumption of meat and meat products is paying for suffering, and that every individual can refuse to take part in it. Bone fractures, hemorrhages and hematoma are the most common injuries in birds (it is estimated that there are 95 percent of multiple bone fractures in broiler chickens), and they occur as the consequence of extremely rough handling and cramming animals into small crates or transport cages. Physical and mental stress in pigs is particularly increased due to the fact that pigs suffer from the so-called "motion sickness" (they show a high level of sensitivity to noise, motion, changes in their surroundings, etc. ), which is manifested in increased excretion of saliva, vomiting, diarrhea, increased body temperature and apathy. Research shows that after 24 hours sheep and lambs lose up to 8 percent of weight, which is a consequence of frequent waste passing as a reaction to extreme mental stress. Even after long periods of thirst, sheep will often not drink water from an unfamiliar source. Dehydration, suffocation and being stamped to death are common causes of death. For more photos from the demo please click here.